Webpraxis Web Design Manchester have been working with the Dame Kelly Holmes Trust and the LFE to produce the website for their upcoming Create Your Legacy event. 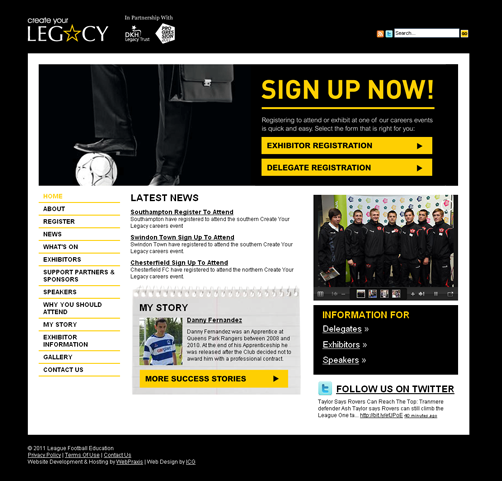 The create your Legacy events are taking place on Thursday 17th March 2011 at Reading Football Club and Thursday 24th March 2011 at the Manchester Velodrome, Dame Kelly Holmes and Gareth Southgate will be speaking at the southern event with Dion Dublin and Clarke Carlisle speaking at the north event . The event aims to provide elite level athletes and those seeking alternative or complimentary occupations the opportunity to further their career by giving them the chance to talk to recruiting employers, find out about further training and any education which may be available. Our work will involve website development, landing page consultation, and optimisation as well as registration tracking throughout the sign up process, we will be producing reports detailing the ROI of a variety of offline and online marketing mediums including print, email, social media and strategic partnerships.